This little cutie is truly original! All bags from the Hip Bag Company are handmade, so no two are ever exactly alike. They're as individual as you. Created by a mother-daughter artist team, they RECYCLE scrap leather, VINTAGE jewelry and EXOTIC leather remnants from some of the finest manufacturers of leather products to produce stunning works of art that you wear on your hip! This buttery soft black cowhide bag features genuine alligator, hair-on-hide and steer head printed leather. How cool is that?! No bling. It's understated and sleek, but definitely with personality! Twisted brown laces cascade down the front. Wear this on a bike, out with your horse on the trail, or at a country music concert. It's good for anything you need to carry with you but want the freedom of not having to carry a bag. Wear this bag clipped onto your belt loops for hands-free carrying of your essentials. It's big enough to hold your phone, money, ID, and whatever else meets your "must have with you at all times" criteria. It has an exterior pocket on the back, and includes a 42" matching leather strap inside, giving the bag added versatility. Add the strap when wearing something like leggings or a skirt, with no belt loops, or when you want a completely different look. It also has a secure turnbuckle closure. 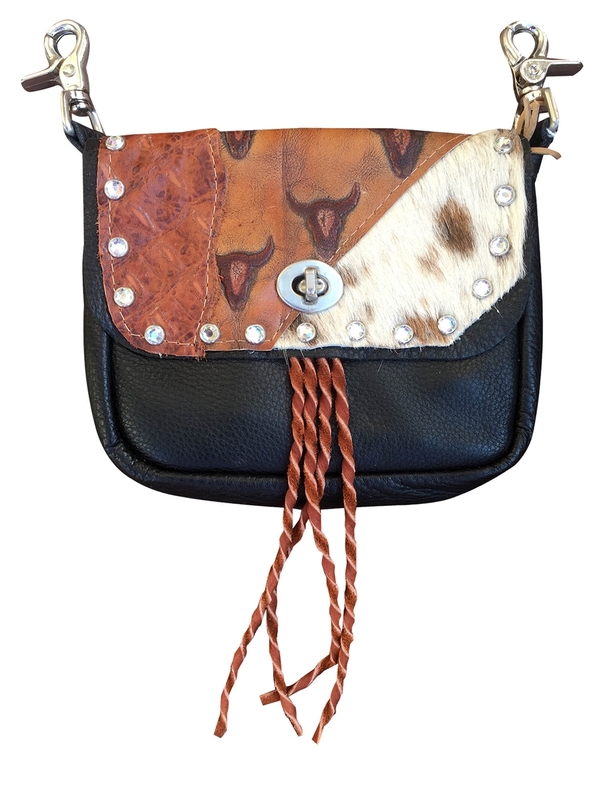 Please note that animal hides may have individual marks that are a part of the natural leather, and these are intentional and what adds character to each piece. First one who grabs it gets it. This is the only one.